Today is veterans day, so I decided to to dedicate this post to the men and women who serve our country. I'm also having a little fun remembering some of the more memorable military wrestling characters, and others who were real life heroes. Let's start with them. 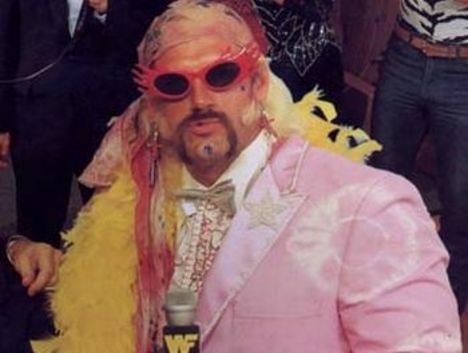 He may not look like it in that picture or in any of his ring attire for that matter, but Jesse "the Body" Ventura was a member of the United States Navy for about six years. This was during the Vietnam era. Ventura was a part of the Underwater Demolition Team. Of course the "Body" went on to have success in the ring and on the mic as an announcer before becoming the governor of Minnesota. Thanks Jessie for your service. The Road Dogg was more than just a member of the DX Army in the late 1990's. He served in the United States Marine Corps too. Six years to be exact. Brian James was also a platoon sergeant during the first Gulf War in 1991. He was responsible for 33 men during that conflict. Thank you Road Dogg for your service to the United States. Jesse Neal is a member of Ink, Inc. in TNA. But before he hit the ring he was putting his life on the line for our freedom. Neal spent four years in the United States Navy. He was also on board the USS Cole in 2000 when it was attacked by a suicide bomber in Yemen. 17 sailors died that day, including Neal's best friend. If you look close enough, Neal honored his friend's memory with a tattoo on his forearm. After that experience, Neal suffered from post traumatic stress disorder. 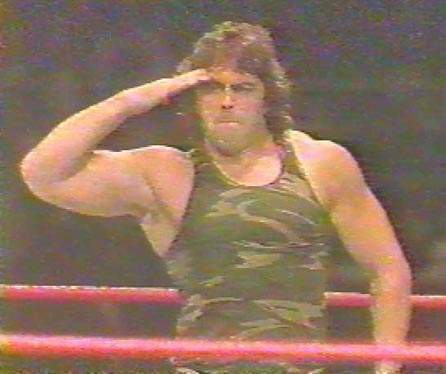 He finished his service to our country and joined the ranks of professional wrestling. Thank you Jesse Neal for putting your life in danger for our country and God bless your fellow sailors who died or were hurt that day in October 2000. Thanks also to my friend Chad for pointing this story out to me. Sgt. Craig Pittman served our country in the Marine Corps. After his time there was done, "the Pitbull" joined the ranks of WCW. He came in as a heel and feuded with the patroitic "Hacksaw" Jim Duggan. Pittman's character in the company was a tough as nails kinda guy. The storyline said he had left behind one of his men while serving in the Gulf War. That man was Cobra and while he was abandoned, he learned to wrestle and made his way to Atlanta to sign a contract with WCW. Crazy, right? That's the fun of wrestling. Pitmann would eventually turn face but never really achieved anything more than the midcard status. He left WCW in the late 90's. Thanks to Sgt. Pittman for serving our country. 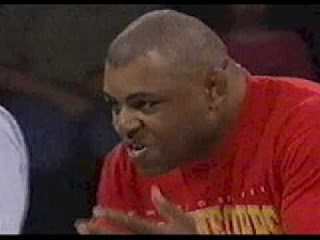 Other real life veterans include the late Bryan "Crush" Adams. He joined the military after high school and served in Japan. That's where he also started training for a career in the ring. Former ECW champion turned MMA Fighter Bobby Lashley served in the Army. Sgt. Slaughter of course is probably the most memorable and most popular wrestling "veteran." In the 1980's, while this country was at odds with Iran and Russia, Slaughter became America's hero. He stood toe to toe with the evil Iron Sheik and his side kick, the big Russian brute Nikolai Volkoff. Of course in that feud, the sarge was in charge. His popularity lead to a G.I. Joe action figure and a cameo on the cartoon series. That made Slaughter a real American hero as they used to say. In 1990, something happened to Slaughter. 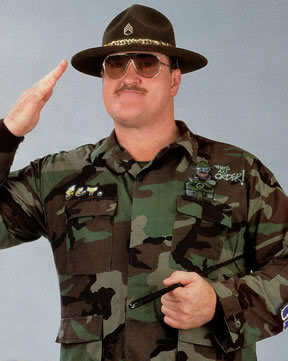 He returned to the WWF, but this time he was anti American. It was the start of the Persian Gulf war. Slaughter embraced Gen. Adnan (an Iraqi) as his manager and Col. Mustafa (the Iron Sheik) as his second. He even won the WWF World title, but lost it to the company's resident patriot and all around do gooder, Hulk Hogan. Of course this change of heart didn't last forever. It was about two years later that Slaughter broke his ties with the villians and taped several vignettes proclaiming "I WANT MY COUNTRY BACK!" If I remember right, a tear even streamed done his check. In the years that followed, Slaughter retired and has come back from time to time to plenty of admiration and fan fare. When Sgt. Slaughter left the WWF in 1985 or so, we needed a new hero. So we got this guy, Corporal Kirchner. He was no sarge. That's for sure. But I'm not going to knock the guy. He resumed battles with Sheik and Volkoff, but ended up jobbing to them a lot more than Sgt. Slaughter ever did. Probably the biggest highlight of his run in the WWF was a victory over Volkoff at Wrestlemania 2. That was in a flag match, perhaps the first one ever. I don't know about that. When he left the company after a suspension over drug use, Kirchner changed his persona and became Leatherface. He's wrestled off and on through the years and most recently was thought to have died. WWE had written a statement on their website a few years ago memorializing the former superstar. But Kirchner is indeed alive and well. As I wrap this up, I decided to include the Misfits in Action. Basically just so I'd have an excuse to post a picture of Major Gunns. Sorry, it's true. This band of mid card guys included GI Bro (Booker T), Gen. Rection (Hugh Morris), Lt. Loco (Chavo Guerrero), Cpl. Cajun (Lash LeRoux), and Major Stash (Van Hammer). This was a lame gimmick I thought and of course it didn't last long. The group started crumbling when Major Gunns turned her back (and her guns) on Gen. Rection and joined Team Canada. Lt. Loco went loco a short time later and turned heel too. That led to the demise of this group. And with the expection of Chavo, you don't hear much about any of the others involved. There's probably a reason for that. So there you have it. Some seriousness mixed with a little comedy. My salute to the men and women who really do (and did) serve our country and to those who played veterans on TV. Where's John Cena? He's the Marine.